The other day Vivi Barnes and I got together to hang out and chat about her book. We videoed it so you could join us! Intrigued yet about her book? If so, check out her incredible book trailer over at Hypable.com here. I’m super excited about going to Vivi’s book launch in November! 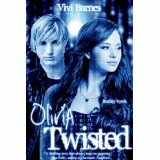 OLIVIA TWSTED is a retelling of Oliver Twist, and as a big fan of retellings, I can’t wait to read this book. How about you? What are some of your favorite retellings? I haven’t either so I’m really excited about this book! Thank you, Leandra! I’m excited! =) And thanks to you too, Christina! So fun! This sounds awesome! I’ve seen the cover around a few places, but the blurb totally makes me eager to get my hands on it! Neat interesting “twist.” Sounds like something I’d enjoy reading! Sounds like an interesting book. Awesome that it focuses on her computer abilities. Oliver/Olivia… cute. This is a timeless tale, and Vivi Barnes should be commended on tackling it. I’m always looking for more YA contemporary. This looks like a great read.